The dark nights are creeping up on us and so it’s at this time of year that I like to pull out my paper lanterns and brighten the atmosphere in my home. 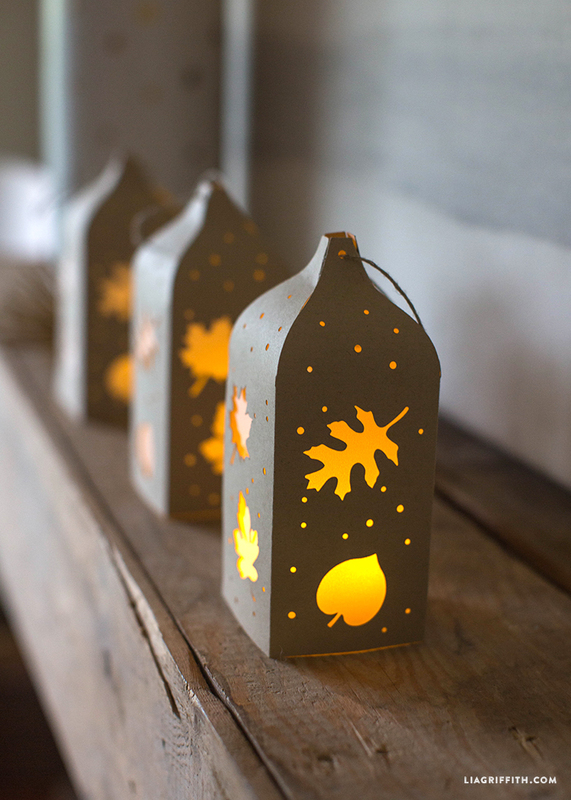 Our latest fall paper cut lantern pattern is perfect for those of you with a cutting machine. It is delicate and is full of intricate leaf patterns that a cutting machine can achieve easily. 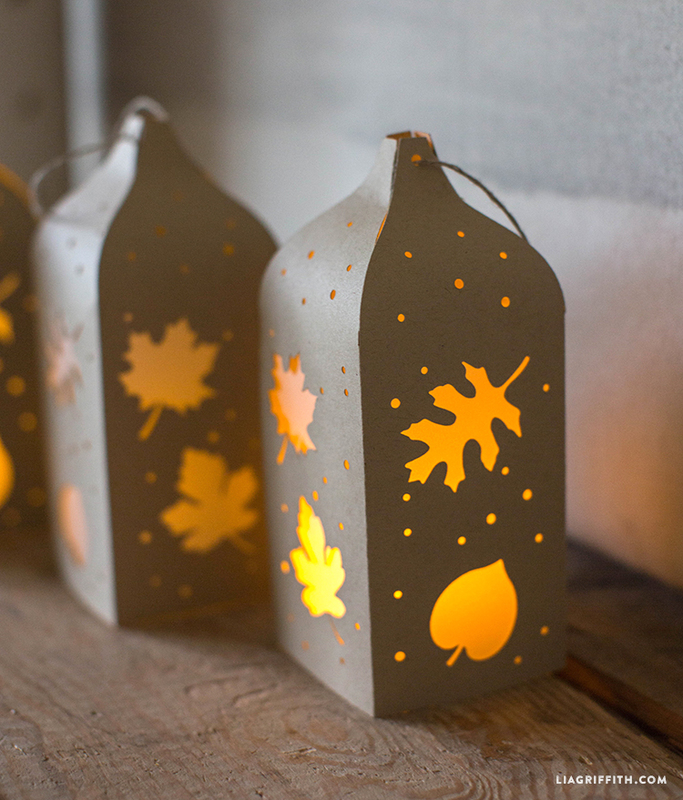 Of course, you can use our PDF pattern to cut this lantern by hand if you want to. But with a cutting machine, you can click on the SVG file below and have it cut and ready to assemble in minutes. Also if you need a lantern just for the Halloween season, check out our Halloween lantern, which features a spooky graveyard scene. We used a shimmering frosted paper for our fall paper cut lanterns as well as vellum paper window and battery-operated LED lights inside. Assembling this pattern with a low-temperature glue gun is the quickest and easiest way to put it together, but if you don’t have one, then a good paper glue is fine too. You can shop this post below if you want to get yourself a glue gun. I couldn’t do what I do without mine! 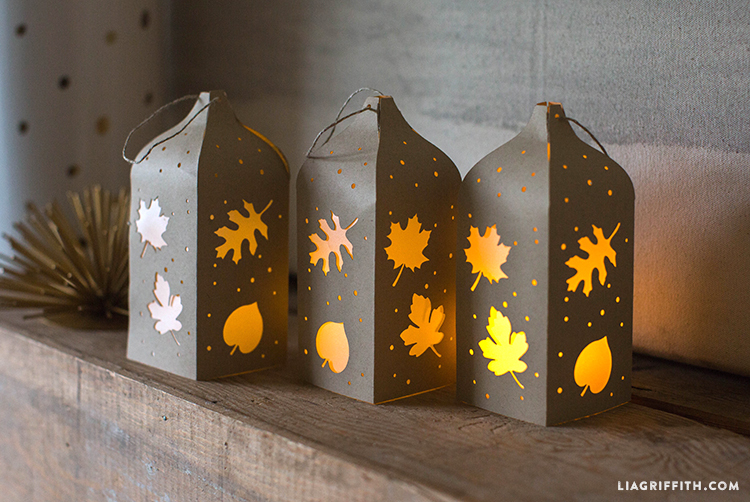 However you choose to make this pretty fall paper cut lantern, have fun! How large are these lanterns? Lovely, but just can’t make the top tabs look elegant when adhered. So I cut the tops off and punched a whole lower down for cord/ribbon. No instructions on the template but not hard to figure out. That’s one way to do it! We like using glue dots/rollers because they make for a very clean finished project, and you can reposition if needed. OKAY, DOES THE FLAP ON THE ONE SIDE GO IN THE INSIDE GLUED? Hi Lia, I want to try the fall lanterns. I have the Expressions 2 model. How to I download the SVG file? I am not too savvy on this. Please be informative. Any info appreciated. Thanks. And I love your designs. Unfortunately with the Expressions model, you cannot upload your own SVG file into Design Space to use as it requires a cartridge instead. You would need a newer Cricut like the Air. Can I do this using Cricut Expressions? Unfortunately, Cricut Expression require cartridges and you will need a Cricut Explore to upload your own SVG files. Hello Lia, I use the Eclips2 machine and software. I recently downloaded the Fall Lantern. When I bring it onto the mat I see the lines where it should be folded, but in my software it is cutting the lantern completely apart. I tried to merge but it still cut them all the way thru. Can you give me some advise on how to cut this out without the panels being cut thru? I would appreciate it very much. Hi Terry! I’m not familiar with the Eclips2 software, but in Cricut Design space I have to select those folding lines and change it to “score”, or else it will cut everything in the design. Hopefully you can find that option for your machine! I downloaded the SVG file for this project to use on my Cricut Explore Air. I get a message that states remove exclusive content and I can go no further. This is the first time I have used one of your SVG files. How can I get this to not be seen as exclusive content? Found out it was an issue with my computer! Thank you so much for the great projects! Love these lanterns! I am getting the same “remove exclusive content” error message and it won’t let me go any further using that image. Can you tell me how to resolve this issue? ^^^^ Yes! Thank you for posting this! Logging out and logging back in worked for me, no more error message! That is really odd. I have yet to hear of that error. Can you try it again and see if maybe it was a Design Space glitch? If not, email us at hello@liagriffith.com and we can trouble shoot further. I had that issue and it was resolved after I logged out and logged back in the Cricut Design Space. Good to know, thank you so much for commenting! Ladies, do what I did last year…I gave myself a Cricut for Christmas! Best gift I ever got. The Lia Griffith edition wasn’t out yet, but I have no problem in uploading the svg files that aren’t already in the Cricut. This machine cuts these tiny holes in the lantern with such precision and all four sides line up exactly. Don’t know how I ever got by without Lia’s patterns and my Cricut! Thank you so very much Polly!!! You are too sweet! we think the Cricut is an EXCELLENT gift to yourself for Christmas 🙂 You always have to remember to treat yourself too! Hi Sarah, did you check the ink levels on your printer? Sometimes when it gets low or clogged it does not like to print as well. Another thing is to download and open the PDF before you print rather than print it from the browser window. Sometimes that will lower the quality of the print. I did cut out all leaf cut outs but have yet to attempt the star dots, will use my punch where it can reach. Boy was that some fiddly cutting out but took my time doing little at a time, good thing have some tiny scissors to get in those teeny spots. Didn’t want it to look messy or hacked at. As above commentor stated you do spoil us every day, sure is appreciated. That is a great hack! Well done!! How do you do all this Lia? Get on today and there are 3 (or more?) new projects to make, holy cow huh? You guys are incredible. Don’t think I got to get on yesterday, busy going to doctor appts. and whatever other chores we had. I hate spending time in any day on dr. appts but sometimes have to do the deed. My right shoulder has been giving me lots of pain, loss of function for over year now, side effect from rollover accident in 98. Looks like the old shoulder ball is worn out so will be having shoulder replacement on Dec. 7th. That’s sure going to cramp my crafting style for this holiday season. Will be watching lots of tv and reading more than anything to keep myself busy. At least when I had knees replaced could still do some crafting. But life goes on and I will persevere another holiday season. Good thing I didn’t sign up for that craft show on Dec. 12th. Won’t be spending much, if any, time on here as it’s already pretty uncomfortable now for me to type. Just thinking of all the projects you’ll have for me to do when I can use arm again, that’s enuf to keep me excited about getting this shoulder in working shape again. I can sure see why having a cutting machine would be more efficient than hand cutting on this new lantern but I’ll give it a try. So pretty, love the leaf cut outs. Might see how the Fall wrapping paper patterns will work for this lantern. Take care and happy creating. You spoil me every day! !